﻿Trust Montessori School is a partnership of children, teacher and families, dedicated to the joyful discovery of each child's innate capabilities and potential. We inspire and educate children to become global citizens by embracing the philosophy and methods of Dr. Maria Montessori, in harmony with other compatible and innovative practices. Trust Montessori School's mission is to nurture and preserve each child's natural curiosity for learning. We encourage children to develop academic, physical, social and life skills in an environment of mutual respect. The school is committed to serving a community of children and families from diverse backgrounds. Ms. An is a certified Montessori teacher with more than 27 years of experience in teaching English and Mandarin languages in the middle and elementary schools in the US. 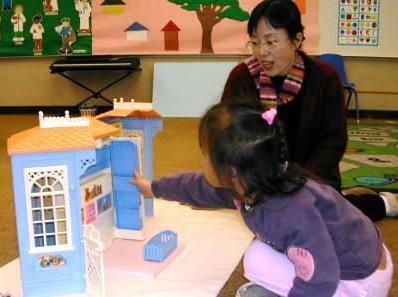 Prior to directing the Trust Montessori School, Ms. An was a director of a private English preschool in Taiwan for three years and for two years as a head teacher of a Montessori school in the Bay Area. Dedicated to the practice of Montessori philosophy based teaching, Ms. An brings trust and love into early child development in a bilingual learning environment. Ms. An received her BA degree in English Language and Literature from Tunghai University and pursued her Master's degree at Univ. of Missouri. After receiving her Montessori credentials, she studied early childhood education at Cal State University and Child Development Program Administration at DeAnza College. Ms. Wang is a certified Montessori teacher with over 22 years of experience in teaching early childhood development, music and dance programs in the US and China. 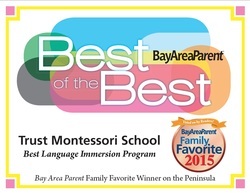 Prior to heading up the Trust Montessori School, Ms. Wang was a head teacher of a Montessori school and as a lead teacher at a fine art academy for three years in the Bay Area. A graceful dancer and musician, Ms. Wang brings rhythm and fun to a child's daily learning. Ms. Wang received her BA degree in music from Changchun Normal University and taught music and dance at Shenyang Institute of Technology and Shenyang Kindergarten Teacher's College. She studied children's education at California State University while being a certified Montessori teacher.